D. Cooper, Juan Gris, Paris, 1977, vol. I, p. 251, no. 1669 (illustrated). This gouache is closely related in the oil painting La Lampe, 1916 (Cooper, no. 666; coll. Philadelphia Museum of Art, gift of Louise and Walter Arensberg). In the summer of that year Gris painted some of his most subdued and serene compositions, wich as Le Violin (Cooper, no. 184; coll. Kunstmuseum, Basil) which show him as heir to the dark Spanish mysticism of the great still-life painter Francisco de Zurbarn. Early in the year, during the spring, however, Gris' approach is decidedly more outgoing and hedonistic. "In his still lifes of 1916 Gris alternated between insolence and sobriety in his use of color. From this and the previous year date several compositions in which objects are densely speckled, as though the painter had admired what Alfred Barr has called the 'confetti-like stippling' in certain paintings by Picasso of 1913-1914. The Lamp is a case in point, and Gris' gouaches of the time reflect the same preoccupation." (J.T. Soby, Juan Gris, exh. cat., The Museum of Modern Art, New York, 1958, pp. 57 and 61). 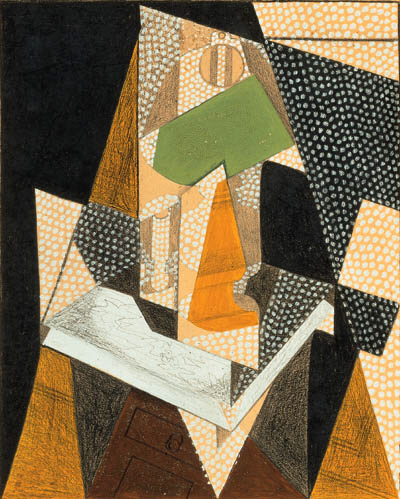 La Lampe is clearly in Gris's synthetic cubist vein, in which he plays with a number of ideas he has utilized in his painting up to this time. The pictorial structure displays the residual influence of the great papier colls of 1914. Although the composition here implies an angled, front-to-back conception of space, and the diagonal shapes strive to give the lamp an impression of being modeled in a spatial context, the forms are resolutely flat, a fact reinforced by the orderly stippling of color. Recalling his papier colls and the use of artificial wood-grain papers, Gris draws on the foreground corner of the table to create the impression (but not the illusion) of a wood surface. "During the fall and winter of 1915-16 Gris allowed his paintings to become more concrete and concise... and made them more legible. He reduced the number of objects represented, used fewer simultaneous aspects, relied for his spatial effect on a bolder and more economical planar structure and used pointillistic dotting to ventilate the composition and create an ornamental effect. At the same time Gris adopted conceptual rather than visual forms, to which he had inclined hitherto, so that he re-created objects in more generalized terms. That is to say, objects lose their individuality but became more unified. Simultaneaously Gris cut down the range of colors in his set of basic forms, but enriched them in another sense by introducing a play of formal metaphors and correspondences between them" (D. Cooper, The Cubist Epoch, London, 1970, pp. 224 and 226). Please note that this work is illustrated in reverse (left to right) in the catalogue. The correct medium is gouache, pencil and charcoal on thin board.